Thank you so much for your interest in the super miner (520GH/19.2MH) shown at our store before, we decided to take it down before more information is available. We got this product info from an agent of Gridseed. And we were told that the miner would be available at the end of March. So we put it at our store. Unexpectedly, it has generated a lot of interest and doubts alike in the mining circle. And we have received messages from a lot of customers, who are both interested and doubtful, which is very understandable, because the information was limited and no one has actually used this product yet. And we have to clarify one fact: WE ARE NOT SCAMMERS. Firstly, we didn’t take any order of the product. None. Secondly, we have been receiving very positive feedbacks from our customers. Anyone who has worked with us knows that we are an honest store. Thirdly, it was not intended as a marketing ploy either. We saw new products coming, we put them at our store, that’s it. So under these circumstances, with the attitude of being responsible to our customers, we decided to take it down until more information is available. At the same time we are requesting for more info and wait until we know better. When we’ve made our previous guide for dual mining BTC and LTC on a Gridseed 5-chip GC3355 ASIC we’ve only had an earlier revision of the miner that used CP2102 USB to UART Bridge Controller. 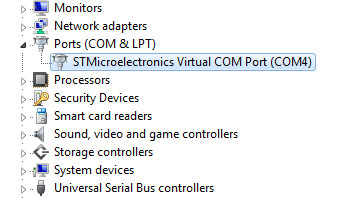 Now that we already have a newer revision with the STMicroelectronics Virtual COM Port we have decided to update the guide with information on how to Dualmine on these ASIC devices. Note that we do not recommend using these devices for dual mining mode, but for Scrypt only mode instead, but you are free to decide for yourself. The advantages of using Scrypt only mode are the low power consumption and heat, the ability to overclock higher, including with a voltage modification and a choice of multiple more up to date software miners. Note that the only way for the moment to use the Dual Mining mode on the Gridseed 5-chip GC3355 ASIC devices is to use the special version of cgminer 3.8.5 for BTC mining (SHA-256) along with the special modified version of cpuminer for Gridseed for LTC mining. 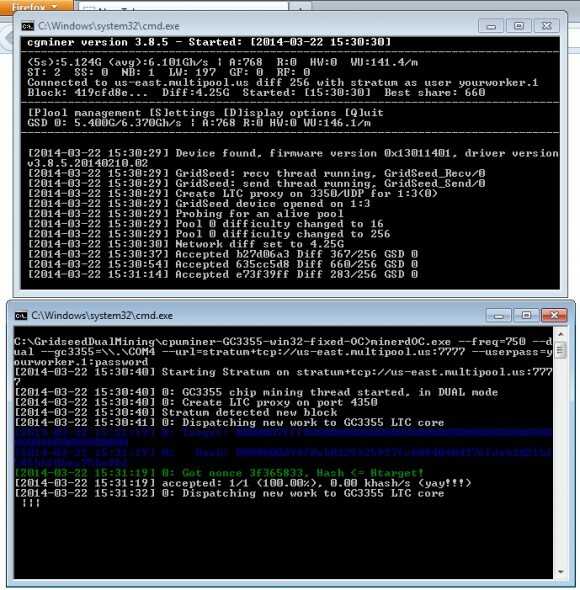 Due to the way that the Dual Mining mode is realized on these ASICs using a more recent version of cgminer or bfgminer for LTC (Scrypt) mining on these devices along with the cgminer for BTC mining is not possible at the moment. If you still haven’t used cpuminer for Gridseed you should know that the software does not report local hashrate, so the zeroes you see are normal, it is actually working and sending shares. Also note that when in Dual Mining mode you will not be able to overclock the device as high as when only in Scrypt mining mode, so it is normal to be getting lower hasrate. As we’ve already said, we do not recommend the Dual Mining mode and suggest to use these ASIC devices for Scrypt mining mode only, especially if you want to run multiple devices. We got a tip from a reader that a new dual mining mode ASIC device based on Gridseed chips might be coming out soon. 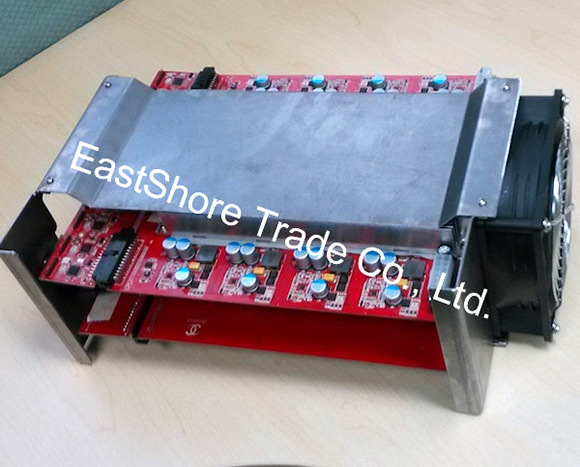 The device is supposedly capable of providing up to 19.2 MHS Scrypt and 520GHS SHA-256 is listed for with a price of $12888 USD on a Chinese online store and is being sold by a company called EastShore Trade. This is a pre-order and they claim the miner will be available “at the end of March”. The photo above of the actual miner does look Ok, though the photo itself and the claimed specifications do rise some doubts, so you should treat this information with caution for the moment! This miner is apparently composed of 4 blades (only one blade shown on the photo or all 4 blades together? ), each blade can mine at a speed of 130 GH/s for SHA-256 mining and 4.8 MH/s for Scrypt mining. 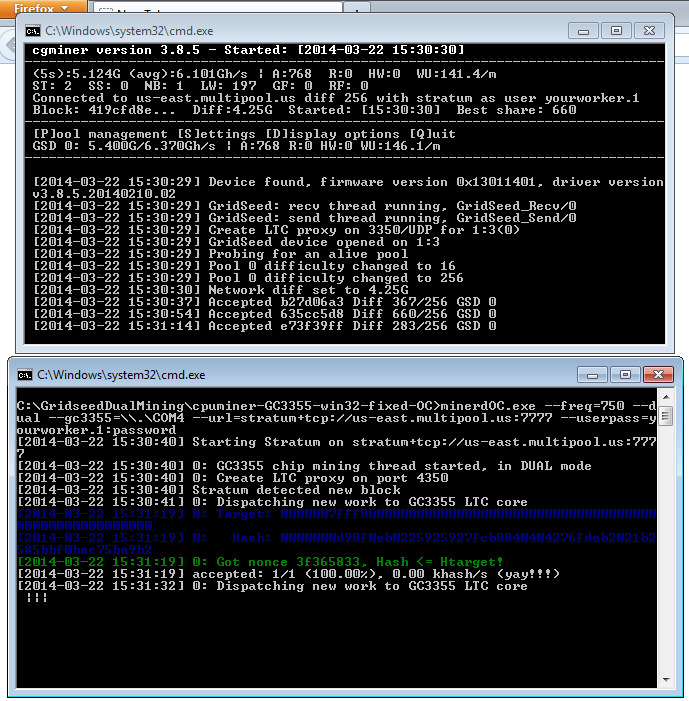 So, the miner can mining at a speed of 520 GH/s for SHA256 mining and 19.2 MH/s for Scrypt mining in total. The total power consumption claimed is just 800W for the four blades and the power supply is apparently a part of the miner according to the information. The miner on the photo does remind us a lot in terms of design to the AntMiner S1 and the device apparently also comes with a LAN port, so it would be independent of a computer. 19.2 MH/s worth of Scrypt mining hashrate is achievable by using a total of 64×5 Gridchip GC3355 processors or a total of 320 chips providing 300 KHS each. With the total power usage of a non-overclocked 5-chip ASIC of about 5W we should be getting about 320W for Scrypt only mining mode if the calculation is correct. The problem comes with the SHA-256 mining part, with a 5-chip solutions needing roughly about 50W in BTC mining mode this would result in 3200W power consumption for the SHA-256 mining only or a total of 3500W without overclock for Dual Mining mode. So how come we see claimed 800W for the device, this could neither be the Scrypt only power usage, neither a single blade one (4 blades shod total in 3200W). And integrating a 3200W or 3500W power supply in a miner so small does not seem very believable (again is the photo of a single blade or of the 4 blades?). So do not be in a hurry with pre-orders at least until there is more clear information about this upcoming ASIC!